Our wounded, ill, and injured warriors have sacrificed so much while serving our nation. Now it's our turn to serve them. Bring your community onboard and hold a fundraiser to support our wounded warriors through the Warrior Support Team™ and outreach program of MarineParents.com. 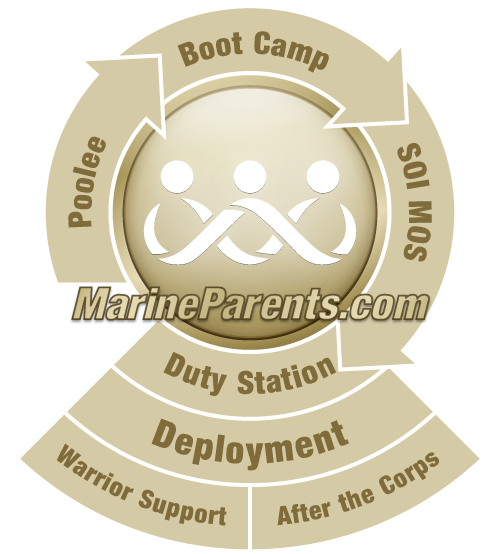 The mission of MarineParents.com, Inc. is twofold: to support our troops and their family members, and to encourage communities to support our troops. We encourage you to involve your community in holding a fundraiser to benefit our outreach programs and services. We will supply you with brochures, posters and help along the way. MarineParents.com, Inc. is an IRS-approved 501(c)(3) public charity eligible to receive tax deductible donations. Individuals, companies, organizations or groups that are interested in holding a fundraiser for MarineParents.com are required to complete an application with the details and dates of the proposed fundraiser. Applications for fundraising should be completed at least three weeks prior to the event date. Fundraisers must be approved by the corporate office. You will receive an official fundraiser letter on MarineParents.com letterhead when your fundraiser has been approved. Please do not begin fundraising until you have received this written authorization from the MarineParents.com corporate office. The letter will legitimize your fundraising efforts in support of the outreach program you have selected. In addition to the eight types of fundraisers described below, we encourage you to participate in athletic events sponsored through Team Marine ParentsTM as a method of fundraising. For information on Team Marine Parents, please visit www.TeamMarineParents.com. Door-to-door solicitations are not allowed and will not be approved as a fundraiser for MarineParents.com, Inc. Please note that online crowd-based funding through solicitation or groups such as GoFundMe and Fundraizer are not allowed. Should you be asked to donate to MarineParents.com through a crowd-based funding scheme, it is NOT an authorized fundraiser and should be reported immediately. Please read through the description of the eight possible fundraisers below. You will need to specify which type of fundraiser you are planning on your fundraising application. To download and fill out a Marine Parents fundraiser application, please click here! This type of fundraiser involves seeking corporate sponsorships through solicitation to specific corporations and companies through the use of physical presentations and/or distribution of brochures. This may involve ongoing solicitations to a variety of corporations or a one-time solicitation to one specific corporation. This type of fundraising involves asking employees in a pre-selected and approved company or location to contribute through payroll deductions, either ongoing or one-time. You will need to get permission from the employer before you begin, and the employer will also have to contact us confirming approval. This type of fundraiser targets a specific audience for donations, for example, members of a congregation, employees within a company, or members of a particular organization. Generally the fundraiser involves a presentation to the group and collection of donations during a set time frame. This fundraiser involves setting up an exhibit at a planned or existing event with other vendors or organizations. The exhibit would include handing out brochures and soliciting donations either through cash or check contributions to a donation jar. There are several types of events that can be held as successful fundraisers. Persons deciding to hold an event as a fundraiser will be solely responsible for all planning, oversight and expenses of the event. Events include but are not limited to Pancake Breakfasts, Chili Suppers, Poker Runs, Golf Tournaments, Bingo, Trivia Night, Shooting Tournaments, Window Washing, Leaf Raking, etc. For participation in established sporting events such as races, marathons, triathlons, or other athletic events see www.TeamMarineParents.com. If you are part of an interview with radio, television or print media and can make plans ahead of time, we will establish an online donation page that can be promoted as part of the media. Advance notice may not be possible in this situation and will be considered regardless of the timeline if possible. Holding an auction, raffle or 50/50 drawing as part of a separate third-party event may be considered with approval from the event planner. State and local laws apply for each activity. Fundraising programs that are established through corporations may be considered for an official fundraiser. As an example, Chase Credit Card allows card holders to donate points or miles in the form of dollars back to MarineParents.com. Generally, these fundraisers should be established directly within the corporation rather than an independent sales consultant. Please note: Donations contingent on direct sales of product owned by individual consultants will not be approved. Sales consultants are encouraged to make individual donations but may not use the donation in conjunction with or as a basis for soliciting sales of product. To get started on your fundraiser, please complete the application and return it to the office via fax, US Mail, or as an email attachment. If you have questions, need additional information, or have a fundraising idea not listed on this page, please contact the corporate office at (573) 449-2003. Thank you for your support of the troops and outreach programs of MarineParents.com. We look forward to working with you!